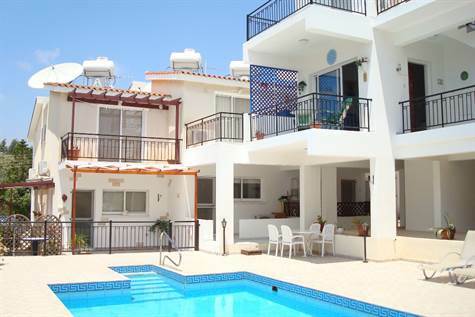 Tala, Paphos, Cyprus - This well maintained one bedroom apartment is located in a quiet residential area within walking distance to the popular Tala Square and local amenities of the village. Paphos Town is a 5 minute drive away. The property features an open plan living area including lounge and large kitchen/diner. Patio doors in the lounge open on to a balcony with sea views overlooking the swimming pool and surrounding terrace. The kitchen is well equipped with lots of cupboard and worktop space. Appliances include built-in oven, electric hob and extractor fan, fridge, washing machine and microwave. A hallway from the living room leads to a large master bedroom and family size bathroom. The master bedroom has plenty of fitted wardrobes and a central drawer unit with mirror and cabinet behind. A second balcony with gorgeous views of the beautifully landscaped gardens can be accessed directly from the master bedroom and also from the kitchen. The property also benefits from an allocated covered parking space and near the parking is a store room providing useful additional storage space. The communal swimming pool with shower and toilet to the side is tiled with roman steps for easy access and is very well maintained. The property comes fully furnished and has full title deeds. Please refer to MLS#: 1010 when inquiring.